James Arlen Ford obituary. Carnes Funeral Home. James (Jim) Arlen Ford, age 70, born in San Diego, California, was called to heaven on Wednesday, February 10, 2016, at St. Luke’s Hospital in Houston, Texas. Jim graduated from schools in El Paso, Texas, and attended the University of Texas at El Paso. He was a member of the United States Navy and was a Radio operator aboard a P3 submarine reconnaissance plane assigned to the VP-6 Squadron. He was a systems programmer during his long career in IT, and had retired from UTMB in Galveston. Jim was bigger than life and loved meeting new people and discovering new things. His knowledge of all things technical made him known and loved among his family as a handyman from heaven. Jim could fix anything; he could build anything. He loved all sports, including softball, tennis, water skiing and snow skiing. He successfully became a certified private pilot and had his master’s license as a captain. He loved sailing his sailboat, Magic, in Galveston Bay and even competed many years in the Harvest Moon Regatta. He was a Harley Davidson enthusiast and made two trips to Sturgis. Most times when you saw Jim, he was wearing one of his Harley orange T-shirts. Jim and his wife, Linda, took a retirement trip in their RV for four months up the Mississippi River, Natchez Trace, Blue Ridge Parkway, Washington DC, Philadelphia and Amish country, Cape Code and Martha’s Vineyard, Boston, New York, Maine, and Niagara Falls. It was their dream of a lifetime, and they returned to their home in League City loaded with pictures, videos, and stories that will leave his family with memories to get them through the days without him. 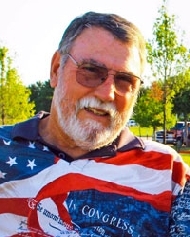 He loved sitting and watching the sunsets with his wife in their back yard, sitting by the fire pit and talking with his son, Stephen, and playing Rummy with his daughter and “Sweetie”, Meredith. He cherished being with his precious granddaughter, Taryn, and his wish when blowing out his candles on his 70th birthday was to see her graduate one day from college. Jim was predeceased by his mother and father, Orpha and Arno Ford, of New Braunfels, Texas, and his sister, Helen Neilson, of San Antonio, Texas. He leaves behind his beloved wife of almost 39 years, Linda, his son, Stephen Ford and his wife, Emily, and granddaughter, Taryn; his daughter, Meredith Brooks and her husband, Ben. Jim treasured cookouts and sitting in his screen room with his family and playing with “Sweet Pea”, his granddaughter, and taking her to the park in his golf cart. He was her “big ole bear” and he loved her with all his heart. He also leaves behind his son from a prior marriage, Robert Fannon and wife, Jennifer, and children, William, and Lizzie from Virginia, his sister, Pat Lund, of Austin, his nieces and nephews, Paula and Billy Rudisill, Lee Ann and GE Smith, Sharon Strasser, Jim Tyra, Billy and Doris Neilson, Renee Neilson, and Denise and Shayne Currin, as well as many beloved great nieces and nephews and sisters and brothers-in-law. Special mention goes out to Amanda Martin of Austin, Texas, who held a special place in Jim’s heart for her thoughtfulness especially during his illness. Pallbearers are Stephen Ford, Billy Rudisill, Bill Neilson, Ron Brown, Joe Flores, and Ben Brooks. Honorary Pallbearers are Arch Hester, Mike Hazelrigs, and Jim Tyra. Funeral services with honors will be held at 6:00pm with viewing beginning at 4:00pm on Sunday, February 14th, at Carnes Funeral Home, 3100 Gulf Freeway, Texas City, Texas. Following the funeral, Jim has requested cremation and a scattering of his ashes in Galveston Bay and in Winter Harbor, Maine.